Pharrell Williams was pictured in Paris on 15th October 2014. Pharrell Williams wore a pink cashmere coat from Céline Fall 2014, and accessorised with a multitude of Chanel necklaces and a customised blue hat from Nick Fouquet. How many guys out there would bravely wear pink and do it with such aplomb? Pink knitwear and socks I certainly do, but a bright pink coat would really be pushing the envelope. Although the boxy pink coat was from a womenswear collection, it actually fitted Pharrell really well. His choice of the quirky accessories certainly made this a standout look. 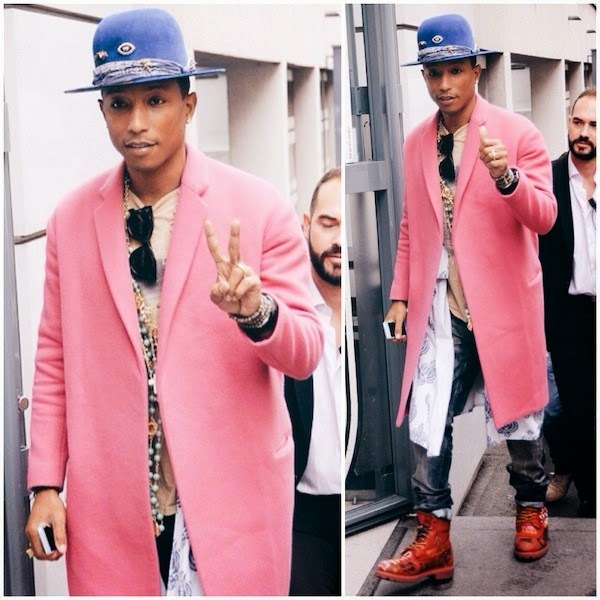 Do you like Pharrell in the pink coat and blue hat? Or too Erykah Badu?? 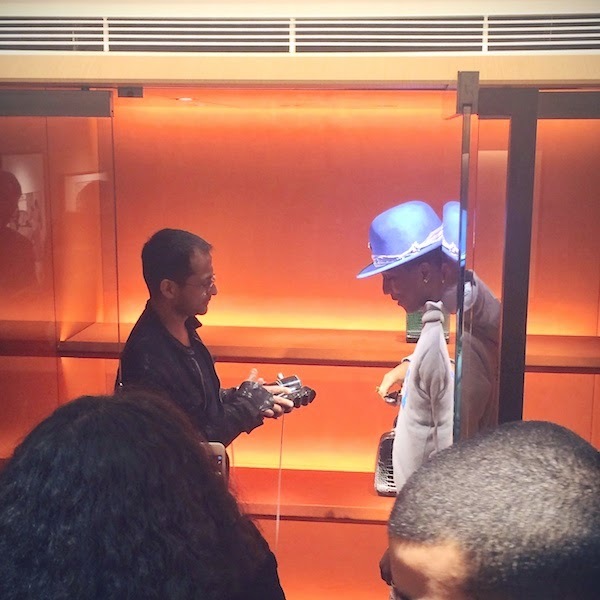 Speaking of his blue Nick Fouquet hat: we had a surprising chance encounter with Pharrell Williams last week. We dropped by Moynat at Mount Street London last week to preview the special range of accessories designed by Pharrell and their design team. In strolled Pharrell and his entourage, and you can imagine how shocked we were. Pharrell dropped by Moynat prior to his concert at the O2 in London to check out the pieces, I believe that was the first time he saw the finished articles for the very first time. 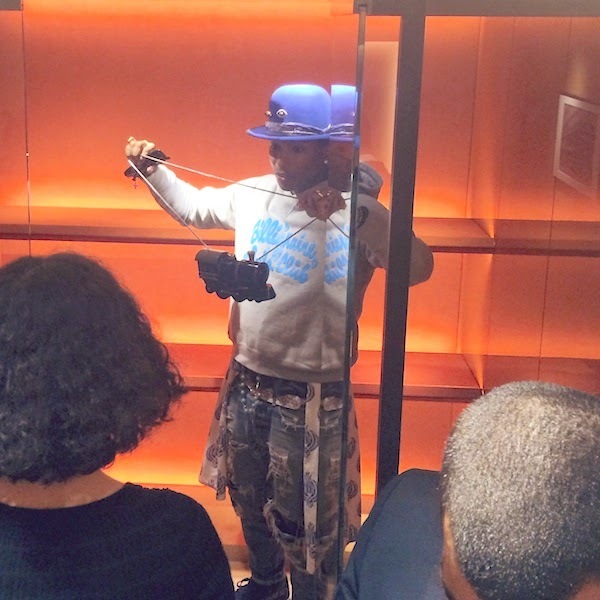 Besides performing in Paris, Pharrell also launched the limited edition Moynat pieces at Colette Paris this week. Here is the very exclusive Moynat x Pharrell Williams resin train bag / minaudière, retailing for EUR10,000. Yes, can I have one please? We were so star struck that we forgot to ask for a selfie. I complimented on his gorgeous blue felt hat, and he said it is from Nick Fouquet, customised with a series of vintage pins he found on his travels. Just like the legend of the phoenix. Happiness is the truth. why did we not ask for a selfie! ?